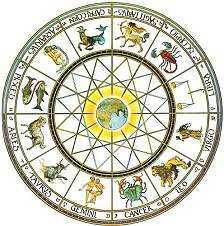 The Zodiac ("Circle of Animals") is the name given to the band encircling the earth on either side of the ecliptic, the Sun's path. It is like a belt in space, about 15-18 degrees wide, across which the planets move and form their aspects, or geometrical relationships. The Zodiac forms the symbolic backdrop for the path of the Sun, called the plane of the ecliptic. Astrologers divide the circle of the ecliptic into twelve equal parts, each subdivided into 30 degrees, making 360 degrees in all. The twelve divisions are called the Signs of the Zodiac. The beginning of the Zodiac is deemed to be the first degree of Aries, marked in the Tropical Zodiac by the vernal equinox, at the start of Spring in the Northern Hemisphere. The signs are historically related (but not exactly identical) to the constellations (star groups) of the same name. There are many constellations, but there are only twelve signs. We emphasize this point in view of the recent furore over the so-called "13th Sign", the constellation Ophiucus, the Serpent Bearer—which has been known since ancient times, but is not and has never been a Sign of the Zodiac. In astrology, the planets, Sun, Moon and other moveable points (such as the Moon's nodes) are still all described as "planets", the wanderers of the zodiac. From our geocentric (Earth-centred) point of view, the planets, including the Sun and Moon, all travel through the Zodiac in the course of their orbits. The Sun takes a year, the Moon takes a month, and the other planets vary according to their place in the cosmic scheme. Because they seem to be orbiting the Earth, the stars and planets rise in the east, move around the earth from east to west, then set in the west (due to the earth's rotation from west to east). Astrologically, each sign symbolises certain specific characteristics in nature and, as the planets move through the signs, they stimulate (or perhaps simply reflect) reactions in both the individual and the collective here on Planet Earth. The Sun passes through one sign a month on its annual passage around the Zodiac. Other planets (not counting the Moon), because they actually orbit the Sun, seem to travel rather erratically through the Zodiac. This is really an illusion, generated by our changing earthly perspective with respect to the planets' placement in their orbits, but it does have some interesting effects. From time to time, all planets except the Sun and Moon seem to slow to a halt ("station") and then begin to move backwards through the Zodiac. This phase is called retrograde motion, which has specific astrological consequences. Read more on Retro Planets.